For about four years of my life, I drank an energy drink every day. It would give me the kick I needed in the morning and there were a couple of good flavors out there, as I’ve never been much into coffee. In the last few months of my Energy Drink consumption, I started to feel some discomfort in my chest and looked into the ingredients…I knew it wasn’t going to be awesome. I found this: controversial amino acid, Taurine, with overtly high amounts of processed caffeine, a redonkcoulous dose of sugar, and a laundry list of other preservatives and dyes with 20 letter names, is a pretty toxic mix, especially for daily or long term use. I needed an alternative. With a quick search, I discovered Zest Tea. A Baltimore upstart producing a health conscious line of teas infused with an effective, yet sane amount of natural caffeine which has a synergistic relationship with tea’s naturally occurring amino acid L-Theanine that helps moderate caffeine’s effect. The list of ingredients was short and sweet and I recognized every item on it. Intrigued, I placed a small order for one tin (16 sachets) of the Blue Lady Black flavor. 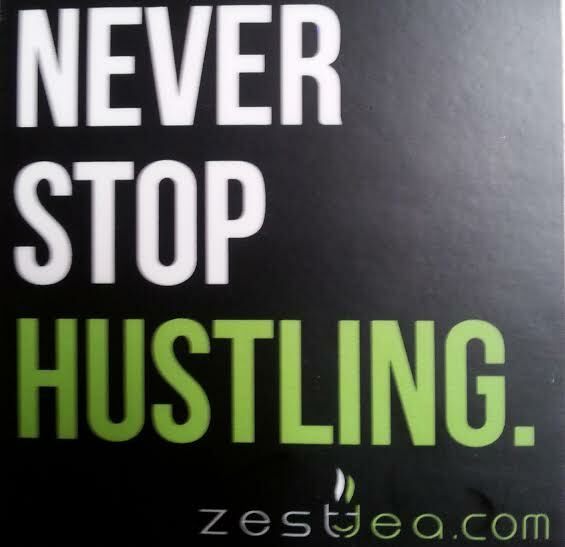 A couple of days later, I received my package including a sample sachet of Pomegranate Mojito Green Tea, a hand signed thank you card from founder James Fayal, a sticker that read “Never Stop Hustling,” and a stylish re-usable tin containing my product. When I popped open my tin the smell was intoxicating. The brewing only took a few minutes and it filled my kitchen with what felt like an aroma therapy session. I made a whole pitcher and put it in the refrigerator. I was anxious to try my new discovery in the morning, knowing it was going to be a manic Monday. In the morning, first things first…it was delicious and refreshing (hot or cold), with a touch of natural sweetness. I also added a little honey. But did it do what I needed it to do? Totally. By the time I got to work, I was just generally in a good mood for 8am on a Monday morning. When I started working, I was in the zone and remained productive throughout the day. My brain and muscles felt less like they were shaken awake for a couple of hours and more like they were gently massaged throughout the day. This was four months ago. I’ve been drinking Zest Tea everyday and haven’t had any chest discomfort since. Plus, it’s soooooo good. At this point I have a nice sticker collection.